Amazon are currently selling the Xbox 360 Wireless Bridge for £33.97 which is the cheapest price I have seen it for. Great if you want to move your 360 around your house and don’t want any wires trawling around the room. It’s easy to install and will pick up most wireless routers without any trouble at all. 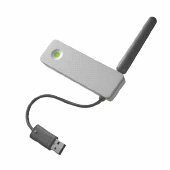 The range of the wireless bridge is also pretty good and should work with no problems between floors and not lose connection, perfect if your Xbox 360 is located upstairs and your wireless connection downstairs. This entry was tagged 360 wireless bridge connection, Xbox 360 Wireless Bridge, xbox 360 wireless connection. Bookmark the permalink.